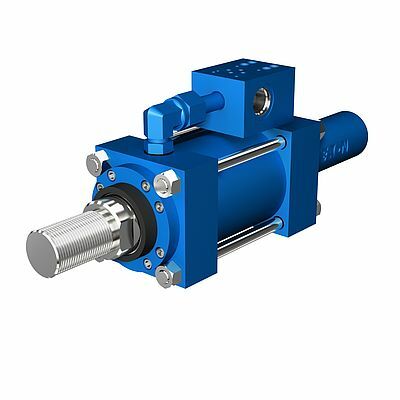 Eaton has announced the launch of a new electrohydraulic cylinder featuring valve integration. The new product comprises a high-performance industrial cylinder, precision feedback transducer and control valve in one package to create a single-source solution which offers significant cost savings over custom assemblies. The new cylinder is a complete system with the customer’s valve of choice pre-mounted on the cylinder. By eliminating the need for separate manifolds, plumbing between control valves and cylinders, transducer mounting brackets and other complex arrangements customers profit from reduced complexity and cost. Eaton electrohydraulic cylinders are offered in NFPA tie rod, mill duty, welded or threaded styles, and are available with a range of mountings, bore sizes and rod diameters. An Eaton proportional, servo, directional control or programmable AxisPro valve for avoidance of repetitive set-ups can be mounted onto the configured cylinder and adjusted to customer specifications. The programmable motion control enables faster cycles than conventional hydraulic circuitry and and helps increasing the production. The cylinders are available with bore sizes from 1.5” – 8” (38.1 mm – 203.2 mm) and stroke length between 0” – 99” (0 mm – 2514.6 mm), customized options are available.